According to the Associated Press, a Gwinnett County jury has awarded $9.85 million in damages in a wrongful death lawsuit brought by parents of a 2-year-old who died in a daycare facility in Buford. The child's parents, Kemi Green and Gbolohan Bankolemoh, enrolled their child, Abiola in a daycare run by Tanya and Shawn Moon. Attorneys for the parents said the Moons falsely claimed their operation was licensed. Tanya Moon's father, Terry Moon, was also named a defendant in the lawsuit. Plaintiffs' attorneys Jeffrey R. Harris and J. Alan Cleveland argued that while Abiola was left unattended, he fell into a pool and drowned on March 19, 2009. Gwinnett County police said Tanya Moon found Abiola lying at the bottom of the pool after being told by another child that Abiola had gone outside. 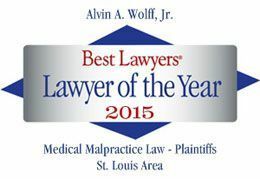 If you or someone you know has been harmed as a result of negligent supervision resulting in a wrongful death, please contact our office for a free consultation at alvinwolff.com or 314-241-2500.